I failed to mention that we were picked at the Amtrak station in Portland by Ryan, the son of Turtle’s best friend, Dave. Dave and his wife were wonderful, allowing two dirty hikers to shower, launder clothes and spend the night. He also drove us to Cascade Locks. A thousand Thank You’s, Dave! We had a hearty breakfast in town before heading out. 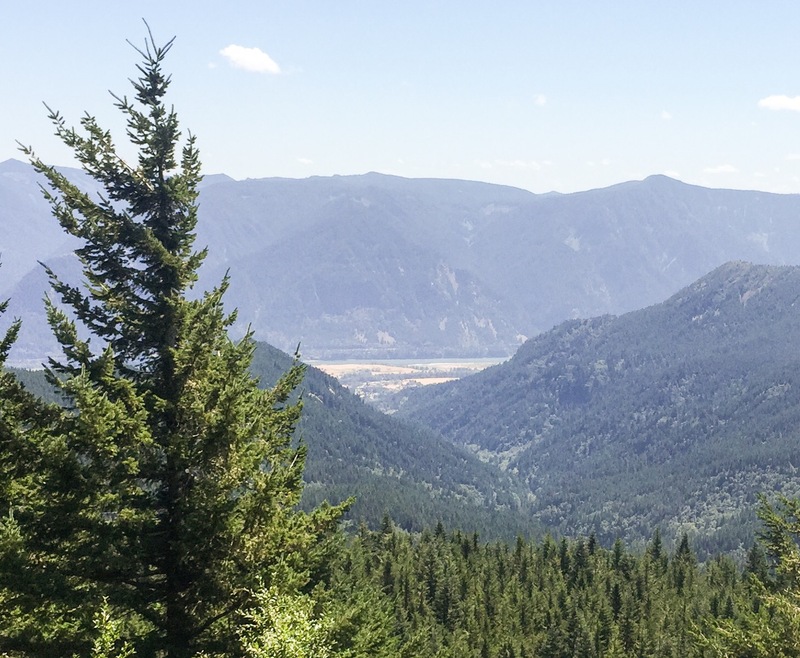 This was going to be a rough day due to the climbing because the Columbia River is the lowest point on the PCT at 200 ft above sea level, so we had to do a lot of elevation gain. We made 15 miles and gained 4,300 ft.
We could see snow covered Mount Hood looking south in Oregon, and snow covered Mount Adams looking northeast. I’m told we’ll see Mount St Helens to the west in a few days. The sun is confused here; It was light out till almost 9:30pm last night. No idea when dawn was as clouds moved in and it was a grey, damp morning. A day of mostly downhill. Due to this and where camping was, we did 20+ miles. More heavy forest today with our first small patch of grassy meadow. It was nice briefly hiking in the direct sun again. The signs of the drought in Washington are evident with the “Seasonal” streams being dry and the other creeks and streams very low. There are wildfires burning to the west of us and being out of cell range we have no idea if we have any heading our way. It’s a sobering thought. Using the Solar Panel during breaks isn’t possible…no direct sun! Another difference from the Sierra is finding a spot to camp! 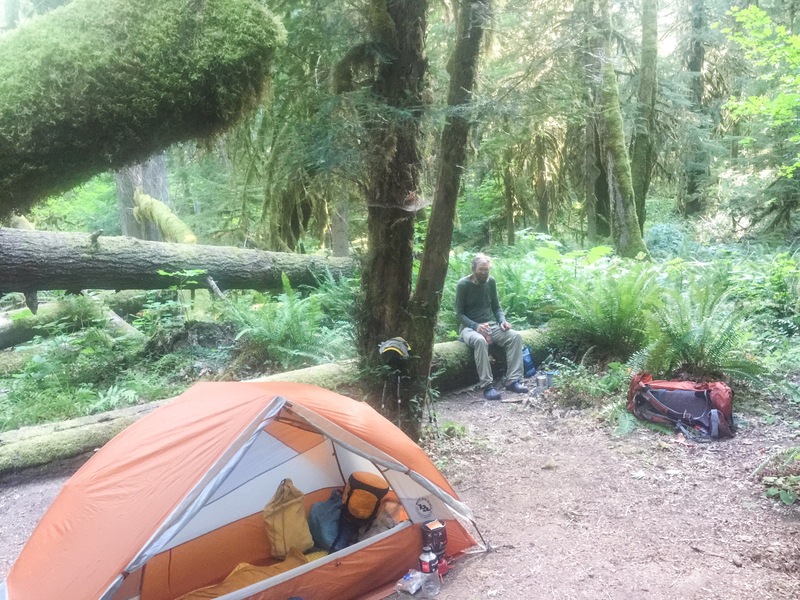 The undergrowth is so thick, there is no “Make your own Camp Spot”…you have to rely on established camp sites. It’s just another difference of a new place. Otherwise it is really gorgeous and we love it. We had Trail Magic this evening. A guy walked by our camp and asked if we were Thru Hikers? He then offered us small packages of Oreos! Miles-Mike was his name. Nice guy and a great dessert. Drizzly rain…the true Washington has arrived. The clouds moved in last night and kept the temperature warm and the humidity high. I didn’t sleep well. The rain started early in the morning and Boy, I wish I had my rain pants already. The rain doesn’t amount to much, but it gets everything wet. When you walk down the trail and brush against the foliage, the collected water rubs off. My pant legs were soaked within an hour and stayed wet all day. Same for my shoes. Thank goodness for wool socks to keep my feet warm. It was another tough day with elevation gain made tougher with the cold and wet. We hiked fast and finished 15 miles and 4,300 ft gain by 3pm. Just as we made camp the rain stopped! It was nice to eat an early dinner, change into dry clothes and crawl into my sleeping bag to warm up. Woke to another grey day, but no rain! It did rain a little on us while hiking, but nothing like Saturday. The trail hit a lot of ridge tops the last two days, but all we could see were clouds. 😞 We made 17 miles and camped off trail at a pond; one of the Surprise Lakes. Lack of water has been a concern since we arrived in Washington. We diverted to this tiny pond just for the water. There were no established camp sites, but we found a couple of flat spots before the evening rains hit. We’ll have to be more cautious in the future. 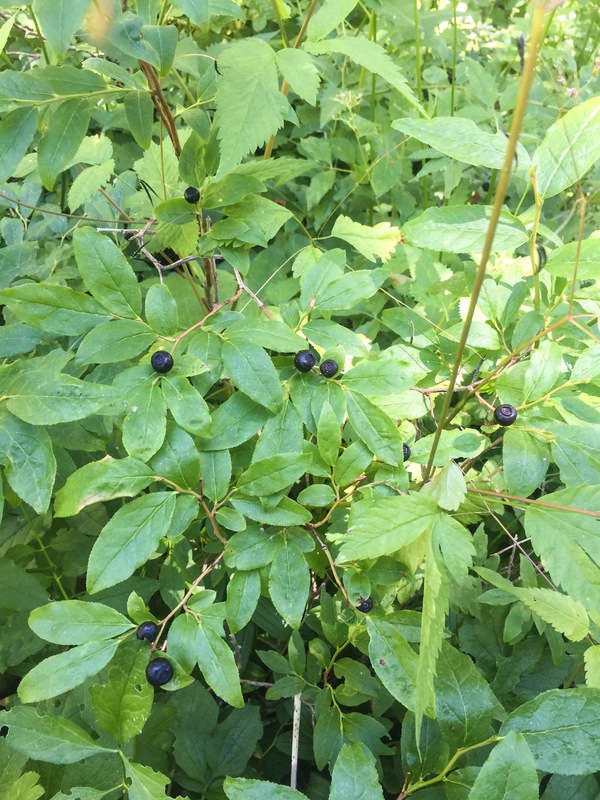 Meanwhile…I learned which berries are Huckleberries! Quite yummy and right beside the trail. A short day since we had arranged to meet two friends of Turtles: Laura and Donny. Laura is the sister of Turtles best friend, they are locals and we had dinner with them in Cascade Locks last week. 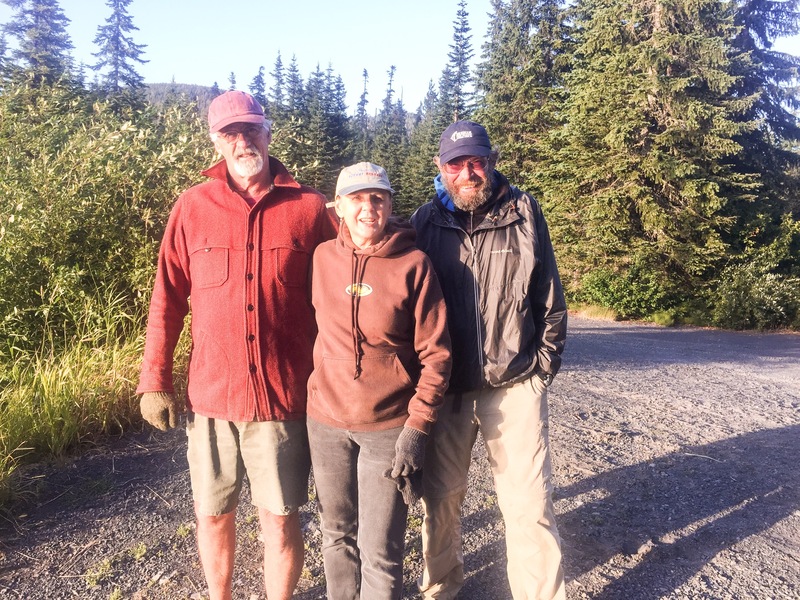 They offered to meet us at Big Mosquito Lake today, and it was just a five mile hike. 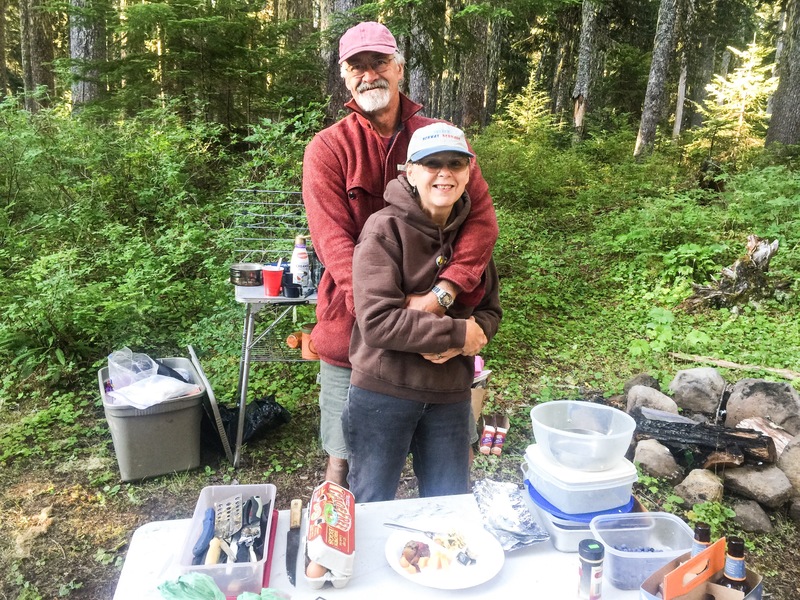 They arrived in the afternoon, made camp to stay the night and cooked us a wonderful dinner! 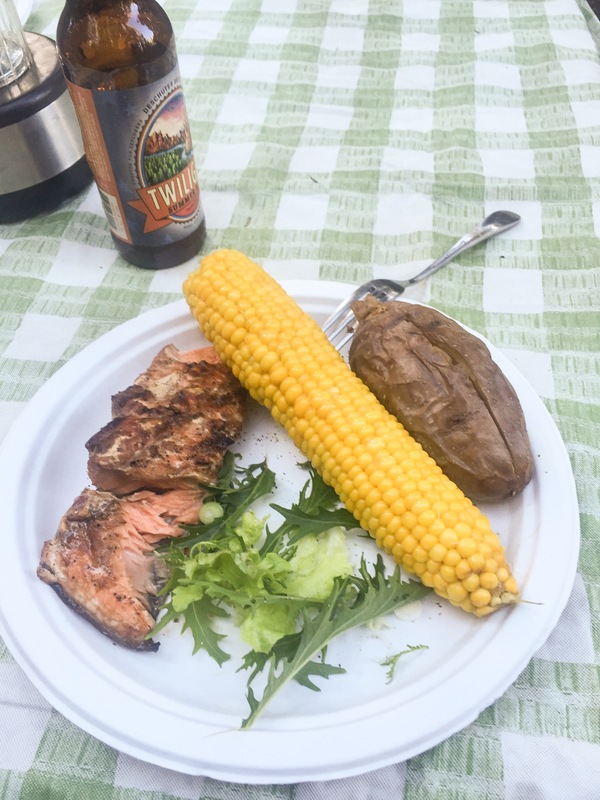 Grilled Salmon, baked potatoes, corn on the cob and salad. For dessert it was Strawberry Rubarb Pie. There was more than enough for seconds and it has been quite a while since I went to bed so full and satisfied. 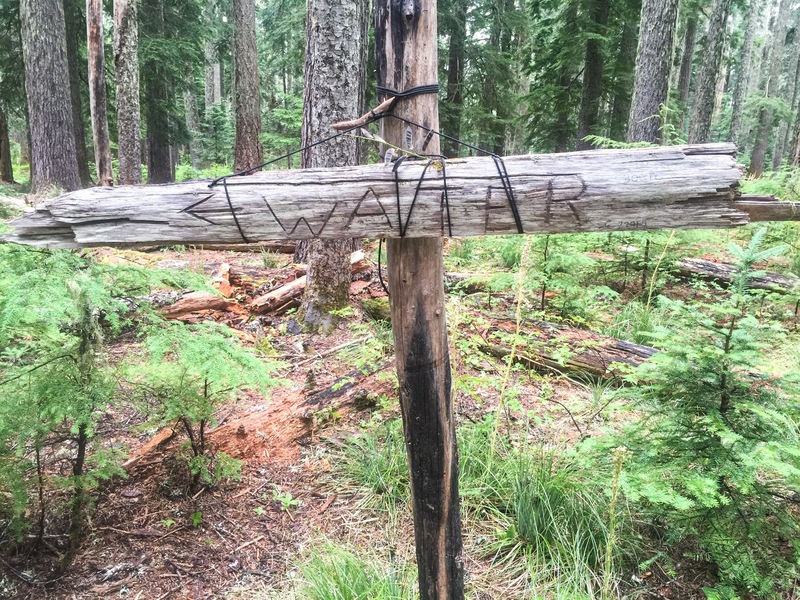 We encountered huckleberries last year hiking in Idaho. They are a great trail side treat!